This super cute birdie is made up primarily of items found commonly around the home. 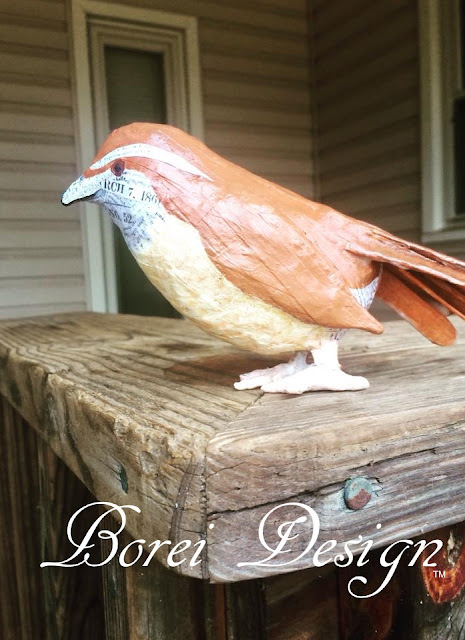 Here's a step by step tutorial and free printable pattern or template to make the adorable state of bird of South Carolina (the Carolina Wren) or almost any other type of bird you desire. There's also a chance to win the supplies for this project and many more free! Note: More details on supplies are located in the body and at the end of this post. 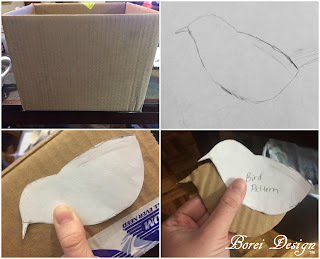 Trace the body from the pattern on a piece of heavy corrugated cardboard from an old box and cut it out. Step 2: Fill in the body with crumpled scraps of paper. Pad both sides of the body with wads of paper. This is a great way to put old sales papers, newspapers or junk mail to good use. Secure the pieces of paper with masking tape and a little hot glue if needed. When finished with the padding, wrap it all in more masking tape for extra stability. Step 3: Add feathers and wings. 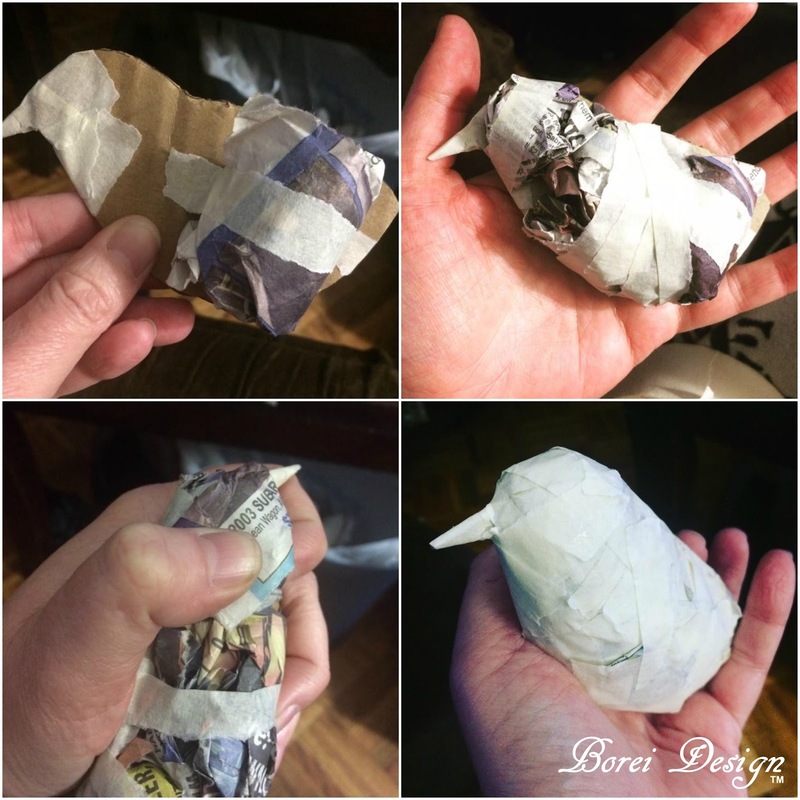 Note: in these pics I did not wrap the cutouts in masking tape until after I put them on the bird. It's much easier to do it prior to attaching them to the bird. Duh, Holly! Step 4: Make legs and feet. I cut tooth pics into pieces and glued them together with hot glue to make feet and toes. 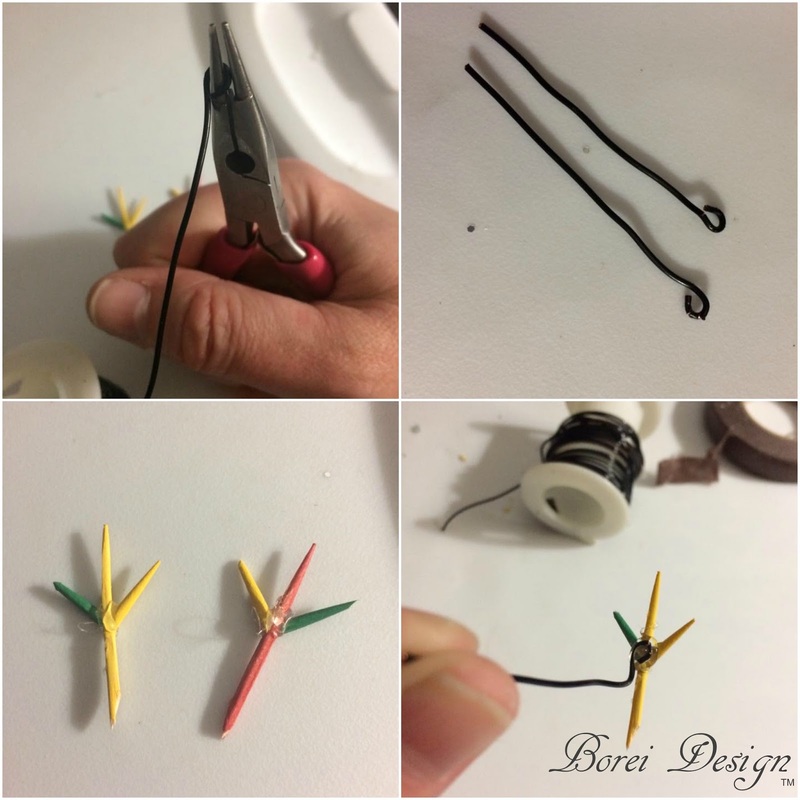 I then cut two pieces of craft wire (for legs) and looped the ends with round nose pliers. I bent the loop forward and hot glued the loop to the top of the foot. To help secure the pieces, I wrapped the feet, toes and legs in floral tape. Step 5: Add the legs and feet to the body. 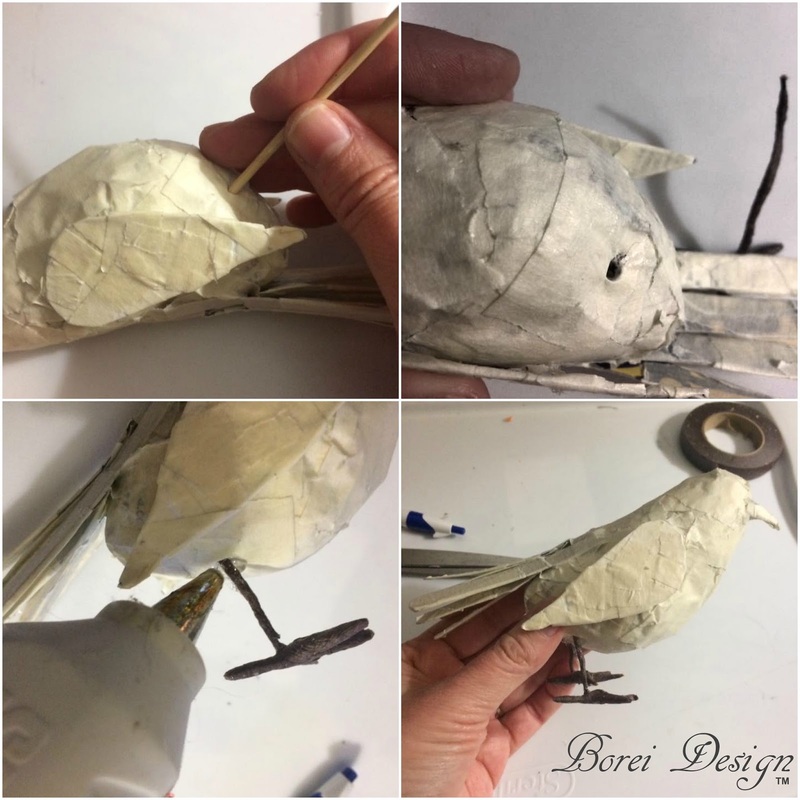 Poke holes in the bottom of the bird (using a skewer stick but a long, thin nail would work as well) and stuck the legs in the bottom of the bird. I added a little hot glue around the opening of the outside to help hold it in place. Step 6: Make Activa Fast Mâché paper clay. 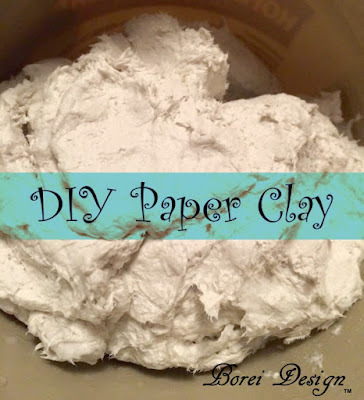 Activa Craft Products makes it SUPER easy to whip up some paper clay. I combined one cup of the paper mix and 1/3 cup of water. I then added more paper mix by the tablespoon (kneading after each spoonful) until it reached the consistency I wanted. I added about two tablespoons extra in total. I also like to refrigerate the clay prior to use to reduce stickiness. Store in airtight container in the fridge between uses. Step 7: Cover with Activa Fast Mache paper clay and allow to dry completely. I applied the clay with my fingers and kept a cup of warm water on the side to dip my fingers in and smooth as necessary. It's sometimes hard for the bird to balance the weight of the wet clay. Prop (or support) the bird in a standing position if necessary using items around the home. The weight becomes lighter as it dries and it should begin to stand on it's own (as long as it's allowed to dry in a standing position.) I added my clay at night so I propped a can beside it on a shelf for the evening and then put it in the sunshine (the next day) to let it finish drying. The wet clay will be slightly grey in color and lighten in color as it dries. Dry clay will no longer be cool or damp to touch. Dry times vary according to thickness of clay, external temperature and etc. If you want a paint finish only for your bird, you can go jump straight to painting it with acrylic craft paint. Afterwards, I recommend sealing it in Mod Podge simply because it gives your project a nice, finished look. I like to decoupage my birds with decorative paper using Mod Podge prior to painting. To decoupage simply cut your choice of paper into strips and paste into place using the Mod Podge. I used laser copies of historical newspapers that have been digitized and are free for printing on the website for The University of South Carolina. If you're using an ink jet printer, book pages or actual newspapers, make sure to spray it with a coat of print fixative and allow it dry prior to using Mod Podge. Otherwise the print may smear. Allow the pasted strips to dry and then paint (if desired). Finish (the dry project) by sponge brushing a couple of coats Mod Podge on top to seal. There are SO many ways you can decorate a paper mache bird. The only true limit is your imagination! I hope you enjoyed this tutorial and his inspired you to make your own. What to snag enough supplies to make a bird and more?? 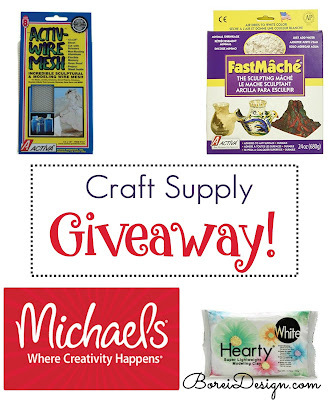 I'm so happy to announce I have a bundle of craft supplies up for grabs! One lucky winner will be sent supplies for this project and many more! 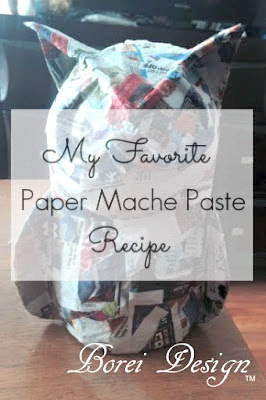 Activa Fast Mache: This is the easiest and quickest way to make paper mache clay that works great! All you do is add water. One box makes a LOT of clay. I opened a new box to make the bird in this tutorial and I can't even tell I used it. Seriously. It makes a LOT! Large Activ-Wire Mesh: This is a way to take your armatures (or base sculpture forms) to a whole new level! You can use this stuff to sculpt like a true pro. Hearty Clay: This modeling clay is the most lightweight air dry clay I've ever had the pleasure of working with. It's like squeezing a cloud! I used it for DIY Rose Earrings and Gift Tag Ornaments. One of my readers recently asked me if it is lightweight enough for embellishments on headbands, barrettes and etc. Yes! A thousand times yes! As someone whom has made a lot of hair bows, barrettes and etc I can confidently say that this will work perfectly! I just wish I would have thought of it before. 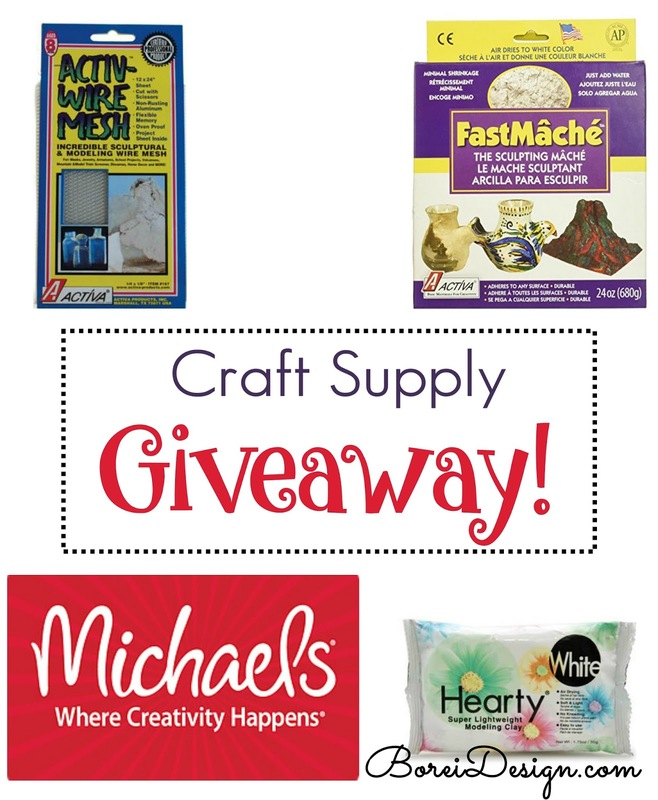 Micheal's Arts and Crafts Gift Card: If you are like me, you are going to want some new shades of acrylic paint for all the great new clay projects you will be planning. As a small token of appreciation, I will also email the winner a $10 electronic gift card to do just that. 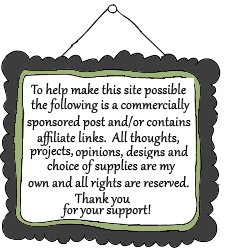 The gift card can be used in store or online for paint or any other items you may need. Note: Unfortunately the Michael's gift card is only valid in the United States. Therefore only U.S. residents are eligible for this giveaway and prizes will only be sent to addresses in the U.S. Thank you so much for understanding. You can view all the terms and conditions for the giveaway here. UPDATE: This giveaway has ended and a winner has been confirmed. Congrats to the winner, Nancy B and thank you all for participating. I LOVE this and have just entered to win! Thanks for such a great idea! I love to craft tshirts and signs! i also just started creating mesh wreaths!!! Oh my goodness how cool is this! I would never have guessed it was made from paper mache had I just seen it it I have to admit. I love scrapbooking and painting. Wow. 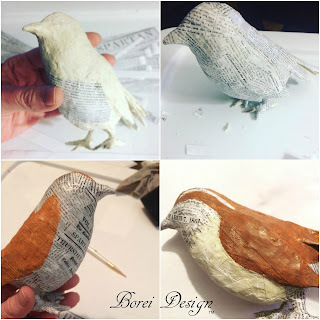 This is a pretty cool craft project! I didn't expect the process to look like this! The bird came out so cute! 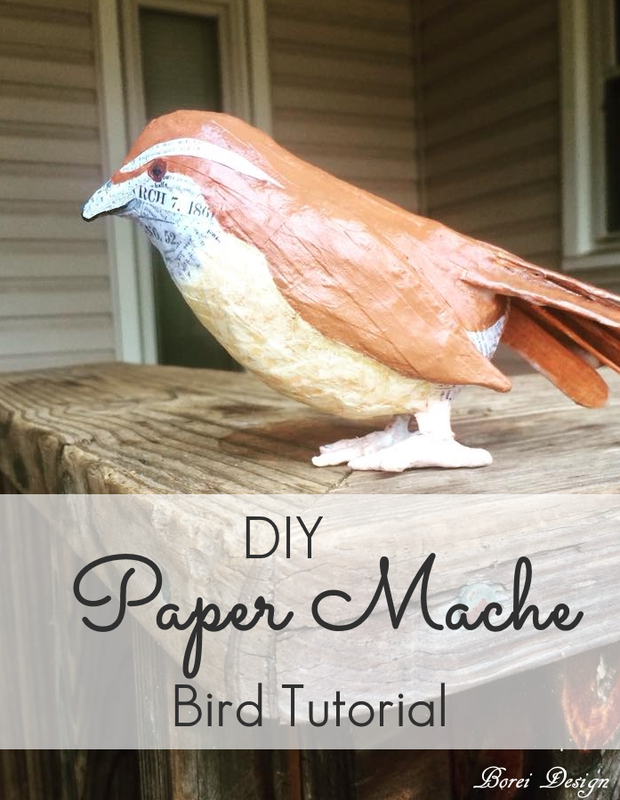 This is so cool, I remember when I was in school my mom would do paper mache with us as a way to get us to do something other than get in front of the TV. Thanks for the awesome memory. 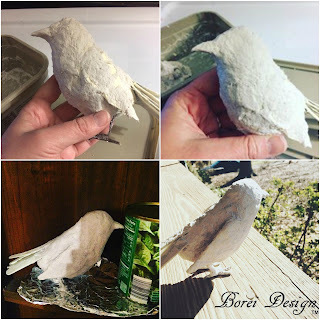 I havent seen anyone do paper mache in a while. I love this looks adorable and fun to make. Aww your bird came out so cute!! I wish I was creative enough to do this! It's been years since I got my hands dirty with paper mâché!! This is such a cool paper mache bird. i know my daughter would love making it. I may have to do something like this at the Library with my library. I don't think I've ever done paper mache with the kids. I bet they'd like it. I did as a kid. Truth be told bird have been one of my favorite animals since kindergarten! This is such an adorable craft. I have to try it, thanks to this very detailed post I feel like I wont mess up! Thanks for sharing. What an interesting creation you have made here. I love creating pinata doing this method for my sons parties. I have never been amazing at making crafts but this is impressive. Looks like it would be fun to make! Such a fun craft activity. These are fun to make. I love to sew quilts and blankets. I also love to paint and repurpose things. You're a woman after my own heart, Paula! 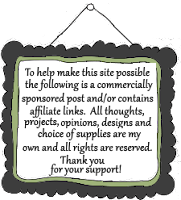 Quilting and repurposing is my favorites too! !